Secrets have a way of coming out. 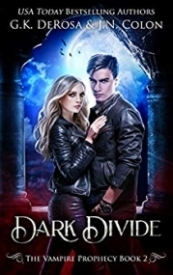 Divided by the dark wasteland between worlds, Kaige and Solaris deal with the consequences of their blood bond and the dangerous secrets they share. Their attempt at normalcy is quickly interrupted when Solaris stumbles upon a gruesome discovery in Imera, one The Collective would kill to keep quiet. Kaige risks everything to save her, realizing becoming king is the only option. With Solaris in hiding, their forbidden feelings spiral out of control. As Kaige struggles to protect her, they learn the truth behind Draconis’s darkest secret. As it turns out, the prophecy isn’t the only thing threatening all of New Isos. Enemies span both sides of the divide, and they’re rapidly closing in on the star-crossed pair. Can Kaige and Solaris find a way to stop the hidden horrors within their worlds before the truth gets them killed? After reading DARK FATES, I knew I had to start DARK DIVIDE as soon as possible. DARK DIVIDE starts right where the first one left off. Kaige is home in Draconis and Solaris is back in the Collective. Solaris promised Kaige to stay out of trouble, but it really isn't in her nature to leave anything unanswered. Instead of keeping to herself, Solaris wants to find out where the blood bags came from, but the source is worse than she ever could've imagined. The Collective is hiding a dirty secret and will do anything to keep it quiet. When she finds herself in trouble once again, it's up to Kaige to save her and only he can help with the bigger picture. But Kaige knows the only way they can change things for the better is if he becomes king. I really like seeing more of the Collective in this one and learning more about Solaris. I also love seeing the bond grow between them and watching how it's changing them for the better. Kaige is so perfect and the ending of this one is insane! This is one fans of vampires will not want to miss. Final Verdict: I recommend this to fans of vampires, paranormal romance, forbidden romance, and prophesies. This book kept me reading from cover to cover and I can't wait to start the third.